We’ve all been there, we’ve all done that. By that I mean instagrammed pictures of where we go, what we do, what we eat, and what we look like. It’s not just the travelers, or tourists who instagram pictures, we locals are just as click happy, as any other person on the planet. If you come to, or are from Mumbai, and you haven’t snapped Marine Drive, or The Gateway of India, or the Hotel Taj even once, your priorities in life need re-thinking. Go Railways! Long journey can get tedious and boring, but not if you decide to get click happy. No but seriously some good pictures can become of taxis, auto rikshaws, bicycles.. who says you must endure boredom at the traffic signal? 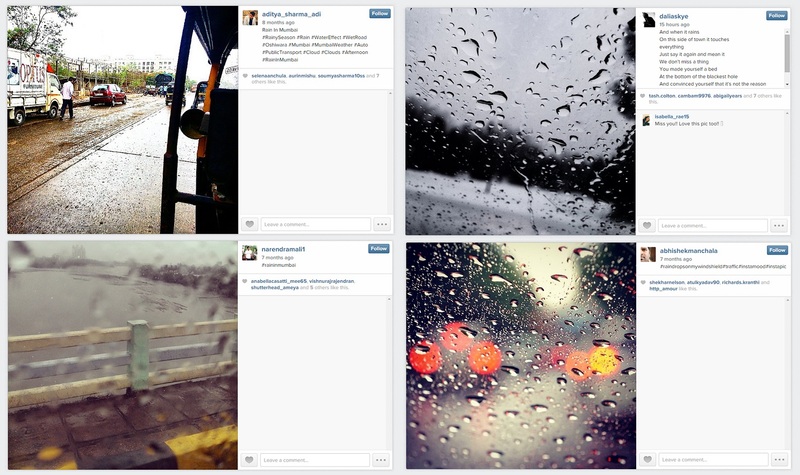 Ah, if there’s is anything that brings out our inner photographer, it is definitely the monsoon. Yes there is the cringe-worthy muck, and the mosquitos and the occasional flooding, and the traffic snarls. Yet, the monsoon, makes us all happy, click happy. O Lord in heaven, bless us as we view you from the lens of a camera, and love you from the clarity of our phone/camera screens. There’s something elusive about this one, we love taking pictures of what we eat, where we eat and who we eat it with. Or sometimes, artsy shots of traffic, street urchins, and stray animals, something in the intensity of their features, make the pictures a lot more hard hitting than intended. Damn, now I want to go click happy.